The second 30.4m Oyster 100 sailing yacht, Penelope, has successfully completed her sailing trials and is now being readied for handover to her owners in November 2012. Penelope's launch marks the second significant step in a long-term project which has brought together the award-winning trio of Dubois Naval Architects, Oyster Group and RMK Marine. 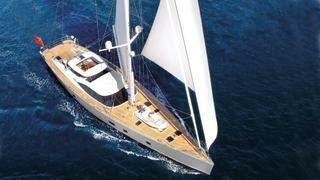 The Oyster 100 is designed with the specification, features and classification of very much larger yachts. The standard accommodation layout offers three staterooms aft and two crew cabins forward. A raised saloon offers a panoramic view and leads forward and down to a more intimate lounge and separate dining area. Forward of the main living area is the crew mess, galley and two crew cabins. A six-cabin variant is also available, offering a fourth double guest cabin forward, in addition to the two crew cabins. Penelope is currently listed for sale asking €10 million through the Palma office of Oyster Brokerage.